simply by snapping a picture. Package Zen scans the entire label and identifies the correct member and member company automatically. Our powerful technology never keeps you waiting or forces you to manually type in any information. Snap a photo and collect a signature. That's it. Your records are completed automatically and accurately. Members receive a photo notification when you snap a picture... and reminders if it's not picked up. Snap a photo of any delivery label. Simply snap a photo and you're done. Package Zen lets you log 50 deliveries in 5 minutes. When you receive deliveries you'll open the Package Zen Mobile App to snap an image of each label. Package Zen automatically processes any shipping label for you. Yes, even handwritten labels. Package Zen does all the work in the background while you move on to the next delivery. We'll never make you do any data entry or wait to log the next delivery. Automatically notify members and clients. Members receive a notification in seconds. Every email, SMS, or Slack notification includes the label image so there's never any confusion. Deliveries piling up? No longer. Package Zen sends automatic reminders to pick up any remaining items. Send notifications by Email, SMS, or Slack... or turn them off entirely. Your notifications and reminders are completely customizable to fit the needs of your office. Sign out any delivery with just a photo . 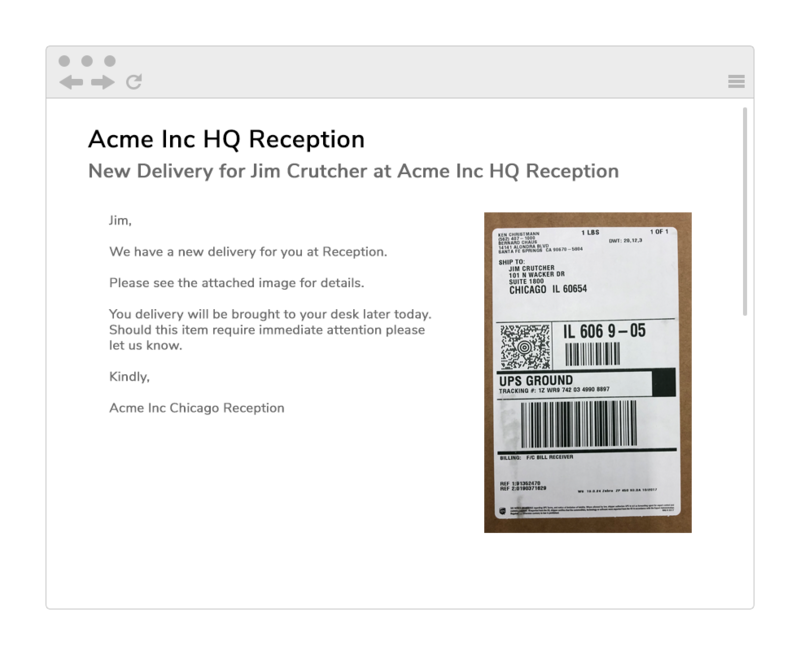 Simply snap an image of each delivery label when it's signed out from you. Collect a signature or customize your workflow to collect any information you need. Package Zen's powerful technology automatically and accurately matches up every image to generate complete, searchable records. You'll never hunt and peck to sign out deliveries or hope that a hurried member picked the right delivery to sign out. Never lose a delivery again. Your Item Log is a complete, accurate, and searchable history of every delivery. 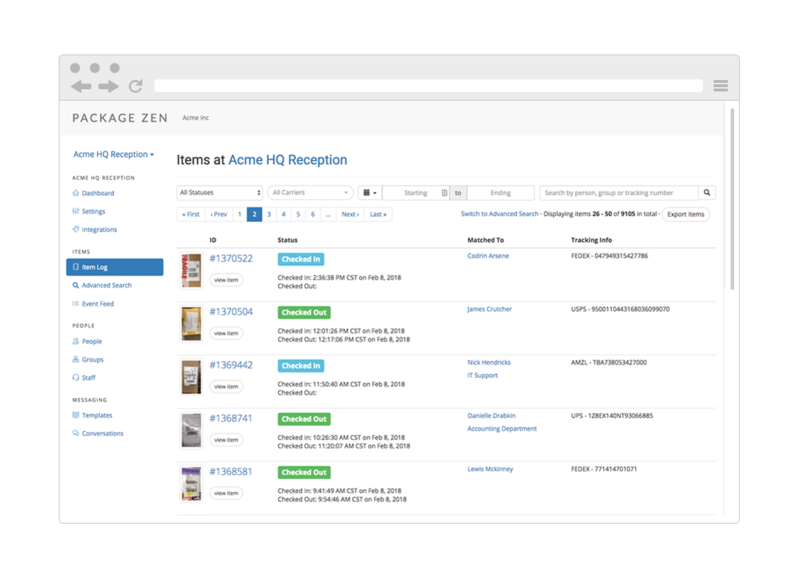 Package Zen transforms your delivery management process with the most powerful search in the industry. Find any delivery by the recipient, any of 1,300 carriers, the tracking number, the date received and any text anywhere on any delivery label. Search by purchase order numbers, reference numbers, inventory numbers, phone numbers. If it's on the label, it's searchable. Any member or client — Package Zen has you covered! Greeting visitors. Handling phone calls. Tracking down everything. Focus on people, not packages! Cut turnaround time 90%. Receive any shipment, generate complete searchable records, and have it out for internal delivery in minutes. Efficiency is just as important as accountability. Log every piece of every load in minutes, complete with photos! Everything included. No hidden fees. Try for free. 100% Free 30-Day Trial. No Credit Card Required.